Do I need to play with thimbles on? I can't reliably hit E on D string. I tried on two different instruments to make sure, so I now think there is something wrong with my fingers. Three out of four times I go to press down, the bone of my fingertip misses the string. So the string is left in the smooshy part of my finger and doesn't make it to the fingerboard even though I am squeezing full-bore. The sound made by a half-pressed string is... unpleasant. So is this a specific something (chubby fingers?) other people have experienced and addressed? Or is it just generic sloppy fingerwork? First off, how long have you been playing? 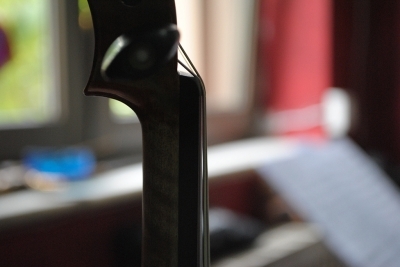 Second, it doesn't take a lot of pressure to get a good note, and "squeezing full-bore" will usually cause more problems in assorted ways than it will solve. My next thought is how high are the strings, like how much space would you say is between the strings and the fingerboard up where the strings cross the nut? If you can manage a close-up pic of your hand as you try to play the E on D or even better, a short vid, I'm sure that at least Pierre (Fiddlerman) would be able to tell you what the problem is. Honestly, I have no idea where the bone of my finger is when I press down on a string. I only need to make contact on the string and it doesn't even need to hit the fingerboard though the quality of sound is better if it does. I know of beginners who played a long time before their fingertips no longer hurt when they play. I can't remember my beginner period and any pain from my fingers but I imagine it's quite normal. What kind of strings are you using? Perhaps you have steel strings with more tension than normal. You could try soft synthetic strings with light tension for learning. Once you get more experience you can switch to medium tension. All very cheap instruments come equipped with steel core strings in case you don't know what kind of strings you have on your violin. Wide fleshy fingers are great for sound by the way. I tried on two different instruments to make sure, so I now think there is something wrong with my fingers. Does the same happen when you try to play somewhere in the middle of the fingerboard? lets say a G or a Bb in the D string with the first finger? Also as Pierre said, some steel core strings could tend to cut into the fingers, and if your action is high, and the string stiff and thing it would make matters worse. What is more, bear in mind that many istruments out there are not set up in a perfect way, or not set up in a way that is pleasant for you. Heavens. Thank you for caring. Or for just being bored. Attached please find a vid at two different resolutions that answers your questions. Right now I just can't imagine playing even a D Major scale at a speed approaching what I hear in music. I guess I was imagining a touch pad when I got this, not a chain-link fence. Well, especially if you're having trouble playing notes near the nut, like the Eb on the D string, I'd wonder if the nut might not be too high. It also looked like maybe your fingernail is long enough that it was keeping you from being able to bring the tip of the finger down vertically onto the string. Others may have some additional thoughts on that though, since I know I keep my left hand fingernails shorter than some players. Other than those possibilities, the only thing I can think of to say is that it is going to come down to practice. Welcome to the forum and grats on learning the violin it's a fun challenge! At time marker 2:08 it looks like your index fingers, finger nail is quite long. May be I'm not seeing things quite right. But I know I have to keep mine quite short. Not being able to press the E flat note maybe the space under the stings at the nut is to high like the bridge was I'm thnking about .8 mm for the G string and .6 mm for the E string is fairly normal. Hi Dorque, maybe the nut is a bit high, but mainly I think you need to give your fingertips a chance to harden up a bit. Once they do, it gets hugely easier to hold the strings down cleanly, even if they aren't exactly centred on the string (and in fact for more advanced playing you often need to stop 2 adjacent strings with the same finger, so you need to be able to do that). Hey Dorque. I watched your video. First of all, forgot to say welcome to the violin world and congratz . Straight to the topic now. Unfortunately I didn't got the chance to see the nut of your violin clearly. Your fingerboard action could be low at some points, but you may have noticed it shouldn't be the same everywhere. Anyway here is a pic of the nut of my violin, where there is no problem with the e flat. If your nut is somewhere close to this (pay attention to the action very close to the nut) then we can go to the next step. If not, it needs fixing, by further filing down the grooves where the strings are placed. Now, if everything is alright, I thing that you should try touching the string somewhere in the middle of the soft tip of your finger. A shorter fingernail as Daniel said above, could also help. 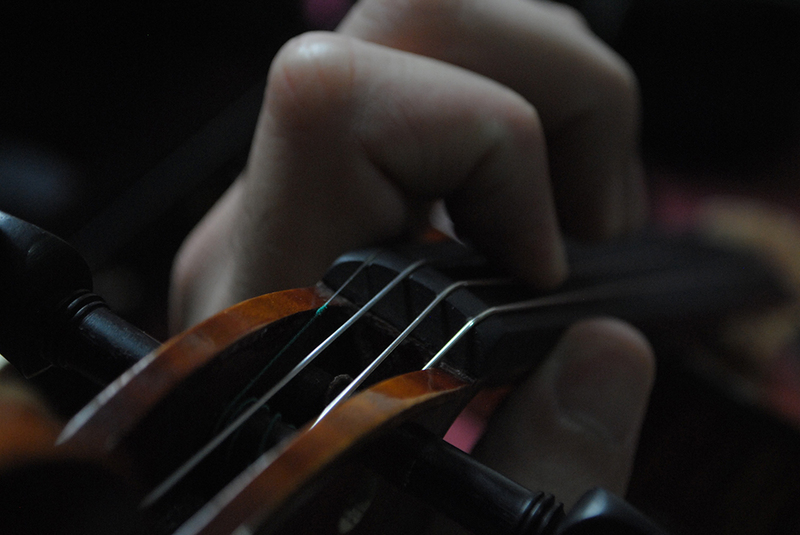 I think that the sound that you don't like occurs when you kinda rotate your finger, almost placing it at the left of the string, and your fingernail close to the fingerboard. To my experience fingernails are the usual culprits that cause funny and disturbing sounds, even if they don't touch the string. P.S. I am not saying that I am showing the perfect way to place your left arm. It's relatively close to what I usually do (shelf shooting from these angles made it a little difficult to be relaxed) and it's not causing me any issues. Some affordable synthetic strings could be Thomastik Dominant, Pirastro Tonica and Daddario Zyex....They also come in gauges, I'm sure you will find something you like. In your video, you say that you cut your own bridge. Looking at the bridge you cute it looks like it's the same height on both sides, now maybe it's a deceiving angle, but the G and the E look to be an equal distance from the belly of the violin. If that being the case and they are at equal height, this will cause buzzing or the strings on the G side. Use a credit card to slide under your strings at the nut, the card should just slide under the strings with no play between card and finger board. Also it appears that you are playing flat fingered, flat fingered with take more effort to depress the strings because you have more meat on that part of your fingers. Try rolling your fingers on to the tips where there is less meat. So sounds like I do have mutant fingers. If I cut the nail on my index finger down till it bleeds it is still the longest part of my fingertip. (Please never say 'meat' in regards to part of a living person again.) But I am definitely concentrating more on the angle of my fingers now. And retraining my brain - in the rest of life, a button is often set between two ridges. Here I need to press the ridge itself. Feels like that's why my finger wants to roll past the string. In the giant bridge that came with the violin (near a 1cm gap between string and end of fingerboard!) the G was humped up as you say. But that made the G, D, and A co-linear so I couldn't bow the D string. I dropped the G on my bridge template and I don't hear the buzz you fear. My nut is about twice that height, so that explains Eb. But my lowrider bridge makes the strings pass the credit card test. File down nut. More finger curl. Put Zyex strings on birthday list. Do more scales. Play with superglue on fingertips to make meat less smooshy. Get past "Can Can" in my violin textbook. Thanks again everybody. There is much awesome here. Play with superglue on fingertips to make meat less smooshy. If you cut the bridge that way, it's wrong. My googling shows that the height of the strings above the bottom end of the fingerboard (nearest the bridge) should be: - the treble side around 3.5mm and the bass side around 5.5mm. 3.5mm - 5.5mm is correct, do you still have that ? 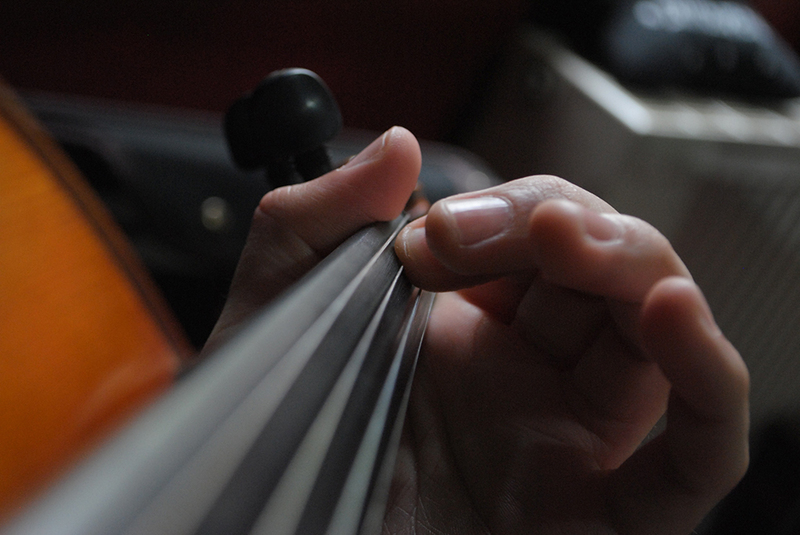 If it still hurts your fingers, try a lighter gauge of strings. Put Zyex strings on birthday list. New strings on birthday list always sounds awesome mate! @Dorque - Hia and welcome ! I have no specific advice to offer, only a "reflection" on what I found as a beginner player a year or so back. I *did* find it difficult initially to get the first semi-tone above the nut on any string, and I avoided even trying. What finally fixed it for me was one of FM's projects last summer ( Thaxted ) which (other than re-tuning my fiddle - which - trust me - WAS an option I was seriously thinking about) required Bb - and there was no way I was "shifting" on a lower string to get it - I just kept on practicing - and FINALLY my hand "relaxed" from the "death grip on the neck" I also had at that time, and it just "happened". Whether this is "normal or not" I have no idea - but it works for me, and that's the best description I can give, and looking back on it, the issue I had with playing the first semitone above the nut was without any doubt at all caused by the "death grip" I had on the neck. Next is to find a finger angle that works as also mentioned above. Perhaps playing on your fingertips will be hard with your fingernails being so long. Just wanted to tack on an epilogue for posterity. (Unfinished threads bug me.) I have indeed been dog-clipping my index finger with some success. But more effective was redoing the bridge along the guidelines provided in those links. I have them set to "fiddler height" of 4 and 2. 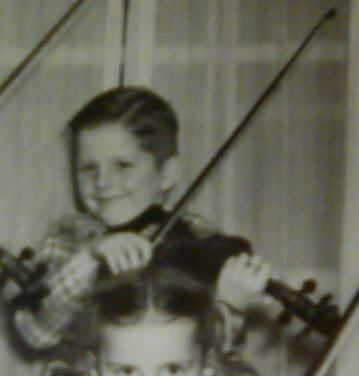 (The ones that came with the violin were 8 and 6. I swear blanks have to be at least 10.) I feel I'm doing 8-slur G and D scales now. Just waiting for calloused fingers now.